SEVEN KINGDOMS will be hitting the road in the states this November! The month-long trek will kick off on November 2nd in Margate, FL and will conclude on November 20th in New Orleans, LA. More dates are soon to be announced... so stay tuned! They are touring in support of their latest 2017 Napalm Records release Decennium which can be purchased HERE. 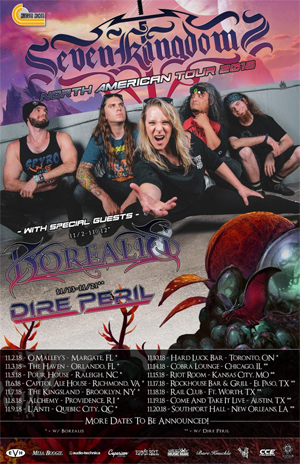 Speaking of the forthcoming tour, the band says: "We are stoked to get back out on the road with our friends in BOREALIS and DIRE PERIL this November! This will be our first shows with Tyler on Bass and also the last shows in support of Decennium. We will be in and out of the studio for the majority of 2019 getting the next record finished! We will be bringing a full headlining set to the majority of North America and look forward to seeing y'all! More dates will be announced soon! Get your tickets!" SEVEN KINGDOMS was formed in Deland, FL in 2007. The band began to play shows, went through all the usual "underground band" ups-and-down; members came and went; numerous local shows; an independently released debut album; etc. Since then, the band have left their mark and have played alongside other metal titans such as QUEENSRYCHE, STRATOVARIUS, HELLOWEEN, BEHEMOTH, and GAMMA RAY, even performing on the 70,000 Tons of Metal Cruise. SEVEN KINGDOMS was added to the HAMMERFALL/ FLOTSAM AND JETSAM tour for the Florida dates in May of 2018 which would end up being the last shows for Bassist Aaron Sluss. Tyler McDaniel then stepped in as a full time replacement on Bass. SEVEN KINGDOMS currently has tours in the work for the end of 2018 and also an album to be recorded in 2019. A band started for fun, found that hard work and dedication to their craft has major pay offs... SEVEN KINGDOMS is carving its own path in metal history creating something genuinely unique, yet undeniably Power Metal!